More than 40 percent of all the fish consumed each year are now raised on land-based or ocean-based aquafarms where fish spend their entire lives in cramped, filthy enclosures and where many suffer from parasitic infections, diseases, and debilitating injuries. The United Nations' Food and Agriculture Organization reports that the aquaculture industry is growing three times faster than land-based animal agriculture, and aquafarms will surely become even more prevalent as our natural fisheries become exhausted. On aquafarms, high-volume systems control food, light (on indoor farms), and growth stimulation. Drugs and genetic engineering are used to accelerate growth and change reproductive behaviors. In intensively crowded aquafarms, small fish are bullied and killed by larger fish, so fish are continually sorted to make sure that faster-growing individuals are moved to the appropriate size grouping. At each sorting, they are netted or pumped out of their tanks and dumped onto a series of bars and grates with varying space gaps to divide them by size and redistribute them into different netted cages or tanks; small fish slip through the small grates while larger fish fall through the larger gaps. This practice, called "grading," is very stressful and results in painful scrapes and a loss of protective scales, leaving the animals vulnerable to disease. High mortality rates, disease, and parasite infestations are common. Deformities and stress-related injuries are also a regular occurrence; on some farms, as many as 40 percent of the fish are blind - a problem that is not addressed because blind fish net the same profit for farmers. Because they are designed to navigate vast oceans and use all their senses to do so, many fish go insane from the cramped conditions and lack of space on fish farms. The tight enclosures inhibit their ability to navigate properly and cause them to knock against each other and the sides of the enclosures. This jostling causes sores and damage to their fins. To increase profits, fish farmers cram as many fish as possible into the smallest spaces possible. Salmon farms are so crowded - with as many as 50,000 individuals in each enclosure - that a 2.5-foot fish spends his or her entire life in a space the size of a bathtub. Trout farms are even more crowded, with as many as 27 full-grown fish in a bathtub-sized space. Many species of farmed fish are carnivorous, which means that fish must be caught from our already-exhausted oceans to feed the fish on aquafarms. It can take more than 5 pounds of fish from the ocean to produce just 1 pound of farmed salmon or sea bass. Aquafarmers have even begun to feed fish oil and fish meal to fish who naturally eat only plants in an effort to make them grow faster. What's more, fish farmers lace fish feed with powerful chemicals and antibiotics to help fish survive the deadly diseases caused by the crowding and filth. It's likely that these fish pellets are the cause of the higher PCB and dioxin contamination levels found in farmed fish, which are seven times higher than the already-dangerous levels found in their wild counterparts. 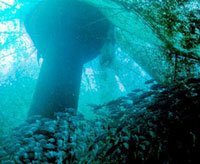 Contaminants from ocean-based aquafarms (fish excrement, uneaten chemical-laden food, and swarms of parasites) spread to the surrounding ocean, and the rampant disease inside the cages is passed on to ocean fish in the area, in some cases increasing the incidence of sea lice a thousandfold. These parasites eat at the fish, causing their scales to fall off and creating large sores. In severely crowded conditions, lice often eat down to the bone on fish's faces. This is so common that fish farmers have taken to calling it the "death crown." In the United States, there are no regulations to ensure the humane treatment of fish. As many as 40 percent of farmed fish die before the aquafarm operator is ready to slaughter them. Fish who survive are starved before they are sent to slaughter in order to reduce waste contamination of the water during transport. Salmon, for example, are starved for 10 full days. Fish slaughter plants in the U.S. make no effort to stun the fish, who are completely conscious when they start down the slaughter line. Their gills are cut, and they are left to bleed to death, convulsing in pain. Large fish, such as salmon, are sometimes bashed on the head with a wooden bat called a "priest," and many are seriously injured but still alive and suffering when they are cut open. Smaller fish, such as trout, are often killed by simply draining water away and leaving them to slowly suffocate or by packing them in ice while they are still completely conscious. Because fish are coldblooded, allowing them to suffocate on ice prolongs their suffering, leaving them to experience excruciating pain for as long as 15 minutes before they die.